In case you missed it on our Twitter or Facebook page yesterday, an Arizona State Sun Devil shared his fun experiences throughout Athens last weekend (click here to see the article). The Classic City played host to the ASU Sun Devils last weekend, and despite the crazy weather, UGA fans provided the Sun Devils with classic Southern hospitality- plenty of drinks, food, and fun. "Athens is a beautiful city with a vibrant downtown that I wish I had more time to explore. What more, Saturday night in SEC Country, despite a torrential downpour bearing down on the city, is unlike anything else I have ever experienced in 25 years of attending sporting events, let alone college football." 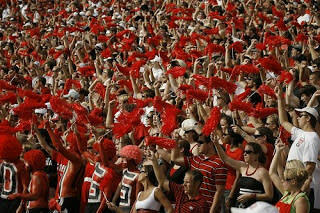 Great job UGA fans- you were a great representation of the Classic City. As for all those Sun Devils- y&apos;all come back now, ya hear?